Bafetimbi Gomis is moving closer to a summer transfer but Lyon are determined not to let their star striker leave on the cheap. Newcastle United are hoping to exploit the fact the 27-year-old is into the last 12 months of his contract to sign him at a much-reduced price. But Lyon hope to play on interest from a number of other clubs to extract as much money as possible for the France international. But French sports newspaper L’Equipe are reporting that Lyon hope to sell Gomis for a fee of £8.6m, rising to £10.3m, whereas Newcastle have lodged an opening offer of £4.3m-£5.2m. Although they will lose Gomis for free next summer if a deal cannot be struck, the Ligue 1 side probably think they are in a strong bargaining position. Newcastle manager Alan Pardew has been applying the pressure on new director of football Joe Kinnear by making it known he wants two strikers this summer. He has confirmed Gomis is on his list of targets, along with Loic Remy and Darren Bent, who may join on loan so that Aston Villa can get a large portion of his wages off their bill, without Newcastle having to pay them all. Newcastle have already had to cross Pierre-Emerick Aubameyang off their list after he joined Borussia Dortmund. Kinnear is under increasing pressure from inside and outside the club because as yet they are the only Premier League side yet to sign a senior player. Wages could also be a problem with Gomis, with the striker demanding around ï¿½60,000 a week. Aulas said earlier in the week that “at least three” clubs had expressed an interest. He confirmed Newcastle were one, but at that stage they had not made an offer. Rubin Kazan and Swansea City both showed an interest in Gomis in January, while Marseille and Fulham are thought to have done so this time. Meanwhile another youngster has left on loan, but only for a month. Defender James Tavernier has joined Shrewsbury Town on loan. They will be the fourth Football League side the 21-year-old has played for. Tavernier has had loan spells with Milton Keynes Dons, Sheffield Wednesday and Carlisle United – all in the course of the 2011-12 season – as well as playing for Gateshead. Shane Ferguson was loaned to Birmingham City this week, while Danny Simpson and Steve Harper have been released, and James Perch joined Wigan Athletic. Newcastle play their first pre-season friendly in England this summer at Blackpool tomorrow. No squad has been announced for the game, but Fabricio Coloccini is expected to be missing through suspension after his red card in Tuesday’s not particularly friendly against Pacos de Ferreira. Papiss Cissï¿½ could make his first appearance for the summer after backing down on his refusal to wear kit branded with the logo of the club’s shirt sponsor, Wonga. United goalkeeper Tim Krul will return to full training on Monday and has targeted the upcoming friendly against Rangers as his long-awaited comeback match. The Dutch international told The Journal that he expects to be fit enough to face the Scottish side in Glasgow on August 6, in what would be his first outing in four months since badly dislocating his shoulder in April’s derby game. 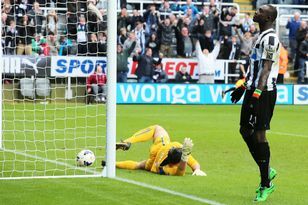 Krul said: “If I don’t get any reaction than I will be back in full training on Monday.